We are a leading Exporter of bulk flow conveyor chain from Anand, India. Available with us is an extensively appreciated gamut of Bulk Flow Conveyor Chain for the customers. 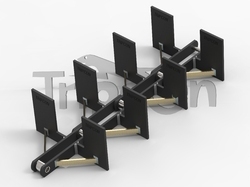 Bulk Flow Chains are made by TRIPCON in wide range of Pitches and Load Capacities as per the requirement of Customer. Excellent Selection in Metallurgy delivers good performance. These offered chain products are widely demanded in the market for their efficient ability to withstand all necessary applications. Our team of assiduous quality checkers test these products as per certain well-defined industry laid parameters to ensure an error free range before dispatch to the clients' end. Looking for Bulk Flow Conveyor Chain ?